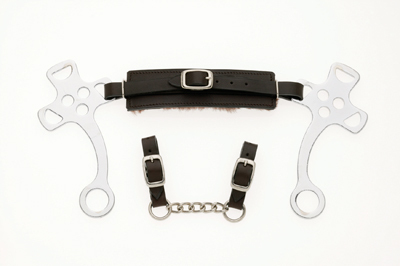 The English Hackamore Bit has a short shank and a faux fur padded nose to provide additional comfort for the horse. This bit from Lorina is made from highly polished stainless steel to prevent rusting and improve durability. One pair of reins attach to the shank to apply nose pressure on the solid part of the nose rather than soft cartilege. It is crucial that this bit is fitted properly so the nerves of the horse's face aren't damaged, and breathing is not restricted. There are currently no questions for Lorina English Hackamore - be the first to ask one!